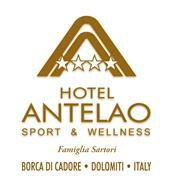 Hotel Antelao Sport & Wellness **** Borca di Cadore is only 12 km. Cortina d'Ampezzo in the Dolomites, declared a UNESCO World Heritage Site. It has 30 superior rooms and 3 junior suites, panoramic and air conditioned, all comfortably furnished. As services offers: 1 cozy indoor spa and 1 SPA in the woods about 800 meters with a rooftop pool of spring water at 33 degrees with thermarium and gym, both of booking massages and beauty treatments. In addition, 4 bars, 1 restaurant, 1 bistro pizzeria, 1 green area of ​​nearly 10,000 square meters, with a playground, two tennis courts, one of which also football and a covered area for events. 1 breakfast room, 1 multi-purpose room for meetings and parties, outdoor parking, mountain bike city bike, and new e-bike, washing area for bikes and motorcycles with covered gazebo for their parking. At 50 meters the beautiful bike path of the Dolomites.